4/14 Cup of Coffee: It was an exciting night in the Red Sox system as six games were played, four of which were decided by one run. 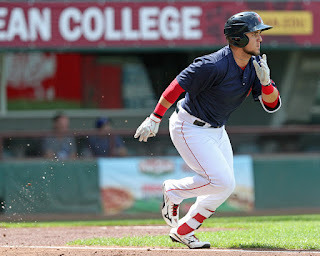 Michael Chavis (pictured) helped Pawtucket reach their highest run total of 2019 with a monster home-run, while the Salem and Greenville lineups came alive to help hold off late comebacks. Portland’s early-season struggles continued, losing both games of their double-header by only a run despite strong performances from Kyle Hart and Matthew Kent. The bats came alive to help Pawtucket cruise to its fifth win of the season, tallying a season-high seven runs. Michael Chavis and reigning International League batting champion Rusney Castillo were the heroes of the night, each slugging a home run. Castillo added another hit, while Chavis went 3 for 4 in addition to his 470-foot home run. Cole Sturgeon also came up big for Pawtucket, collecting two hits, including an RBI double, to open the scoring. On the mound, Josh Smith was devastatingly efficient, needing only 75 pitches to get through six innings while striking out 10 Syracuse batters. Josh Taylor and Jenrry Mejia combined for two scoreless innings to close out the game, each striking out one batter apiece. Continuing Friday night's suspended game, the Sea Dogs were unable to overcome the two-run deficit left to Saturday. Despite having 13 men reach base, Portland was unable to do much damage against the Thunder pitching staff. Aneury Tavarez, Brett Netzer, and CJ Chatham each collected two hits at the top of the Portland order, but Tavarez and Chatham were the only Sea Dogs to record extra-base hits. Chatham has had a strong start to the season, raising his average to .350 on the year. Bobby Dalbec also added a hit and two walks. Dedgar Jimenez was roughed up in his two innings of work Friday night, allowing seven base runners and two runs before the game was suspended. Matthew Kent got the unofficial start Saturday afternoon, striking out four over five scoreless innings. Durbin Feltman came on in relief with a perfect eighth inning, striking out two. Matthew Gorst picked up the loss, surrendering only an unearned run in his 1 2/3 innings of relief. In the second game of the doubleheader, Kyle Hart was sharp once again, but his performance was not enough to give Portland the win as the bats fell quiet. Hart went the distance in the abbreviated game, striking out nine in six innings. A solo home run in the fifth was the only extra base hit he allowed, but it was enough to see him collect his second loss of the season. Brett Netzer was the only Sea Dog batter to reach base more than once and also collected Portland's only extra-base hit with a double. Tate Matheny, Jeremy Rivera, and Joseph Monge each added singles, while Bobby Dalbec walked once and more importantly did not strike out. Nothing was seemed to go right for Salem in the first game of its doubleheader. Enmanuel De Jesus seemed to be in control of the game before it came apart for him in the fourth inning; ending the night with 4 1/3 innings pitched, three earned runs and three strikeouts. Joan Martinez fared even worse than De Jesus, being tagged four five runs (three earned) in his two innings out of the bullpen. No Salem batter recorded an extra-base hit during the contest, and only Jerry Downs collected more than one with his two singles. Despite the poor overall output, Jarren Duran did manage to extend his hitting streak to 18 games and also added a walk. Fans who stayed for the second game of Salem's doubleheader were rewarded with what was the surely the game of the day in the Red Sox system. In a back and forth slugfest Salem overcame the Keys despite a late surge by the Frederick bats. While Garrett Benge led Salem with two hits, including a double, only two Salem batters did not reach base. Victor Acosta and Charlie Madden each added doubles of their own, while Jagger Rusconi matched Madden's two RBI's with a walk and a clutch single in the sixth. Not to be outdone, Deiner Lopez added a triple and a walk in addition to driving in and scoring a run himself. Although Jarren Duran's season-spanning hitting streak finally came to an end, he still had the chance to play hero with a fantastic catch to save Salem from a bases-loaded jam and end the game. While the offense boomed Saturday night, the Salem pitching staff struggled badly. Hunter Smith got the start, but he lasted only one inning as he gave up five hits and three earned runs. Eduard Bazardo came up huge for Salem in relief, going four innings and only allowing one unearned run and striking out three. Andrew Politi earned the win despite matching Smith by surrendering five hits and three earned runs, in addition to a blown save. The Drive were likewise able to stave off a late-inning comeback by their opponents as they downed Rome for the first time in the series. Chris Machamer started the game, but never quite got into a rhythm as he allowed seven hits and three earned runs in just four innings of work. Once again, a reliever came up big for a Red Sox affiliate and this time it was Oddanier Mosqueda who delivered for the Drive. Mosqueda pitched three clean innings out of the bullpen, whiffing four and only allowing two hits. Rio Gomez closed the game out for Greenville and despite giving up a two-run home run in the eighth, was able to earn the save by pitching a scoreless ninth inning. Offensively, the Drive did most of their damage with a five-run fourth inning and were lead by Korby Batesole, who collected two hits and scored twice. Devlin Granberg and Kyle Wren each added two hits of their own but it was Juan Carlos Abreu and Grant Williams who were the difference makers for the Drive, each collecting two RBIs apiece. Triston Casas started at third base and began the offensive barrage in the fourth with an RBI double. Player of the Night: It was another big night for Michael Chavis and the PawSox. Chavis collected three hits Saturday night, including a double and a mammoth first inning home run that Statcast recorded at 470 feet. This performance brought a six-game hitless drought to an end for the No. 1 prospect in the system and was reflective of his opening day performance.